For the crust: Preheat the oven to 375°F. Place the pecans in the bowl of a food processor. Pulse a few times until finely ground. Add the flour, sugar and salt and pulse again a few times until combined. Add an egg and the butter, pulse again a few times until thoroughly mixed and the butter has broken into the smallest of pieces, making it hard to distinguish it from the mix. The mix should resemble a coarse meal; it will not appear to be a homogeneous dough, but it will be all crumbles. That’s what you want. Turn all the pecan mix into a tart pan with a removable ring. Press into bottom of the pan with your hands, leveling it all around. As you press, the mix will start looking like dough. Press a bit to the sides to form a 1/4-inch border all around. Bake for 15 minutes, until cooked through and appears to be lightly golden. Let it cool completely. For the pastry cream: In a medium saucepan, set over medium heat, pour in the milk and vanilla, stir well with a whisk and let it come to a simmer. Just until it begins bubbling around the edges. Remove from heat. In a medium bowl, beat the egg yolks along with the sugar and the cornstarch. Slowly, in a thin stream and with the help of a ladle, pour the milk into the beaten eggs, whisking along to combine thoroughly until all the milk mixture has been poured. Transfer it all back into saucepan. Set over medium heat, stirring occasionally and keeping a good eye on it, let it come to a simmer. Simmer for about 1 to 2 minutes, until it thickens to thick cream consistency. You may stir with a spatula as it simmers so it doesn’t stick to the bottom. Remove from heat. Let it cool, wrap with plastic wrap and place in refrigerator until ready to use. For the fruit: When ready to assemble the tart, vertically slice the cheeks of the mangoes. With a small knife, cut around the cheeks to make it easy to remove from the skin, and scoop out with a spoon. Cut the cheeks into slices. For the glaze: In a small saucepan, combine the jam with the wine. Set it over medium heat. Stir or whisk a couple times, until it dissolves and it begins to simmer. Let it simmer 1 to 2 minutes. Set aside. To assemble the tart: Pour the pastry cream onto the crust. 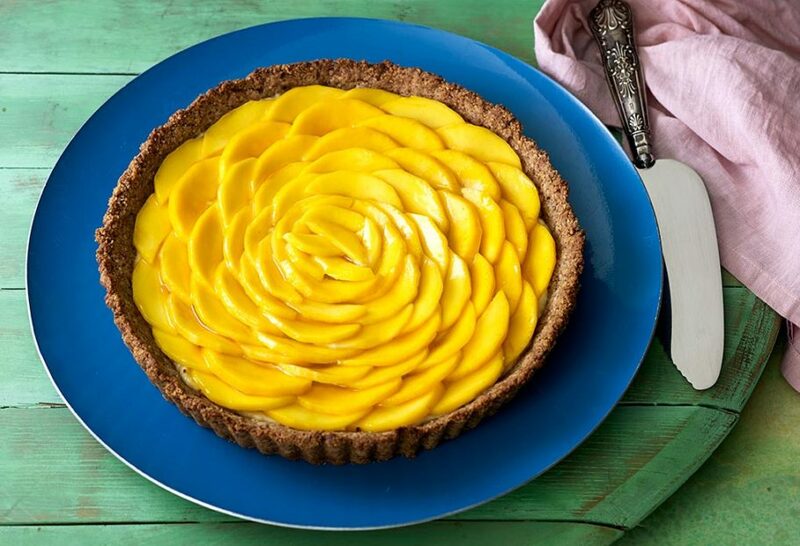 Place the mango slices, going around the tart until you reach the center. With a pastry brush, brush the glaze all over the mangoes. If the glaze has cooled, heat for a few seconds until it becomes liquid again. Place the tart in the refrigerator at least for an hour to set and chill. Honey mangos are divine! How large a tart pan do you recommend for this recipe? Many thanks. I LOVE honey mangoes too, Ann! A 9 or 10 inch pan will work great. Mrs patie I love your Chardonnay Mango Pecan Tart,I’m going to try to make it very soon on my own. I wish I had the recipe for the hold meal with the rice with onions, fish with the garlic,onions,sweet plums and other things. I wanted to put this up on my Facebook but the default huge “PATTI FINCH” instead of the outstanding photo of the Mango Tart changed my mind. Patty Rees una fregona en la cocina y me encanta tu show, pero está tarts es huerfana, NO TIENE MADRE, me encanta, gracias guapa!!! Thank you so much Rima! Yes, I like it better as it is spelled out in the book, I adjusted the quantities to make less of the cream as before it overflowed a bit… Thanks for trying the recipes, yay! Thank you so much for your quick reply, can’t wait to try it! I enjoyed your Book Signing in Denver and have already marked several recipes in your new book!! Me gusta mucho tu programa. Lo veo casi cada sabado aqui en Los Angeles. Me gustaria que hicieras tamales de dulce un dia de estos y de carne. Me gustaria aprender a hacerlos. HI for this recipe do i have to make my crust homemade can i buy pie crust. Either/Or. But making your own pecan crust is super easy and it makes the recipe more special. Thank you so much for this recipe and for your fine cooking. I made the pie and it was wonderful. You’ve introduced me to different Mexican food , here in San Diego there’s Baja and Sonoran Mexican restaurants ( all good ) but I really enjoy San Miguel’s influence! Hi Jayne, Thank you so much for your lovely note and for making the mango tart! I hope you find many more things to try!! I just finished with the entire meal. I made the tar, the fish and the rice. I wanted a little acidity so I sliced an avocado, fresh tomato and a roasted jalapeno with lime and salt. My tart does not look as pretty as yours but I think the flavors are all there. Your instructions were right on and I will take a picture before we eat which is about to happen within the next 10 minutes. I love real Mexican cuisine, I am Colombian but my love for food came out of living in California and learning from mi suegra Mexicana que en paz descanse. Thank you for this site and your amazing show. I watched yesterday for the first time on KERA and when I saw San Miguel de Allende it blew my mind. I have always wanted to visit. I picked my own pecans here in Texas and I am super excited about this Pecan Mango Tart! Hope to post again once I am finished.